Is biking your favorite way to get exercise? Using an indoor bike is the best way to work your muscles without having to go on the open road. There are a few different types of these machines, but the Upright Exercise Bike is the one most closely related to riding an actual bike. It gives you all the benefits of the real thing, without having to suit up for the outdoors! So what are the benefits of using an upright exercise bike? And which one is the best upright exercise bike for you? Let’s check out the top choices right here in our upright exercise bike guide! There are many benefits to using an upright bike as opposed to a seated “recumbent bike” or a spinning bike. Here’s what you can look forward to when using an upright exercise bike. The Upright Exercise Bike works the same muscles groups that you use while riding an outdoor bike. This means that training with an indoor upright bike, will give you a more consistent workout, and it’s the best for training your muscles because it places the body in a similar position to a real road bike. Using an Upright Exercise bike gives you a total body workout, while remaining low impact on your joints. The bikes will work the upper body, lower body, and core, without putting pressure on sensitive joint and ligaments. Upright bikes generally take up less space than the other types of indoor exercise bikes. Many of them also fold up, so they are easy to store away. You won’t need an at home gym to enjoy an upright exercise bike. Which One Is The Best Upright Exercise Bike? There are so many options available for upright exercise bikes that the best one for you depends on the features you need, and your budget. We checked out the top upright exercise bikes in several price ranges, to bring you the best one for your needs. Here are the best upright exercise bikes that you can get right now. The Marcy upright exercise bike is one of the best choices for an affordable indoor bike. It supports up to 300 lbs of weight capacity, and is equipped with a comfortable adjustable seat, and pedals. The pedals are counter balances, to provide you with the best foot support and ultimate control. The Marcy upright bike has 8 levels of difficulty, to simulate all different kinds of terrain. The display on this upright bike is a 2.25″ LCD screen, that tells you the speed, time, calories burned, and distance. You can easily move the Marcy bike because it comes with transport wheels on the bottom, perfect for portability. It comes with a limited warranty, and has all the features you need to get a really great workout. Schwinn is probably the best known brand for regular bicycles, so it comes as no surprise that they make a great version of an indoor bike too. 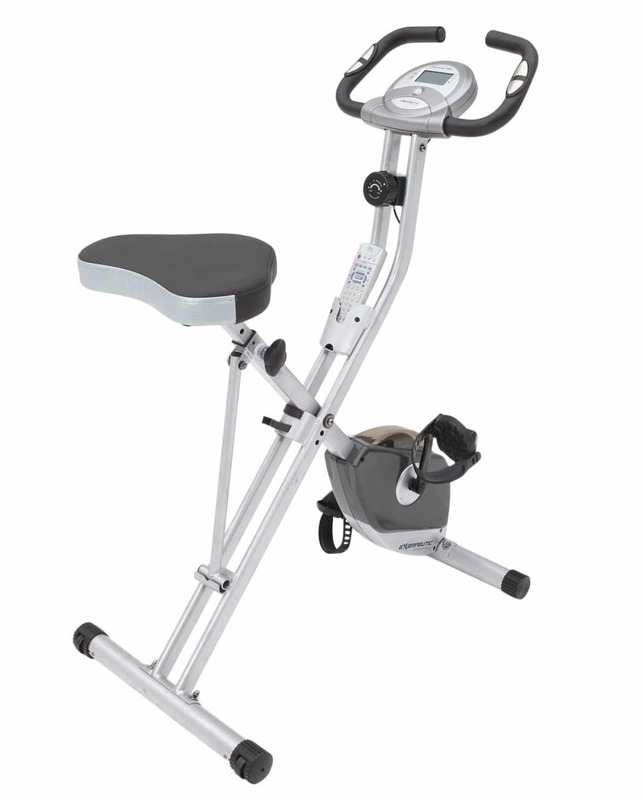 The A10 Upright Exercise Bike by Schwinn can carry a maximum weight of 275 lbs, and has an adjustable contoured seat. You can simulate any difficult terrain using one of the 8 levels of current resistance, while the high inertia flywheel keeps your workout going smoothly and quietly. This fitness bike has a large 5” X 3” LCD display, which lets you monitor allows you to monitor your Result, Speed, RPM, Resistance, Time, Distance, Calories, and your Heart Rate. It’s also got 6 quick start programs to give you a variety of challenges. Schwinn indoor bike comes with a 2 year frame warranty, and a 6 month warranty on the parts and electrical. Overall it has the most features of any other bike in it’s price range, and with a quality brand name you can trust. Another great choice for best upright exercise bike is the Exerpeutic Folding Magnetic Upright Bike. This machine can support a weight of up to 300 lbs, and features a large comfortable cushioned seat. This bike does 8 levels of resistance, and it has “Hand Pulse Sensors” which monitor your targeted heart rate during your workout. The Exerpeutic upright bike also has an easy to read LCD display that keeps track of your distance, calories burned, time, speed, scan and of course the heart rate monitor. One of the best things about this bike is that it is very lightweight, and it can be folded up and stored away when not in use. It includes a limited 90 day warranty, and its a great value for the price. 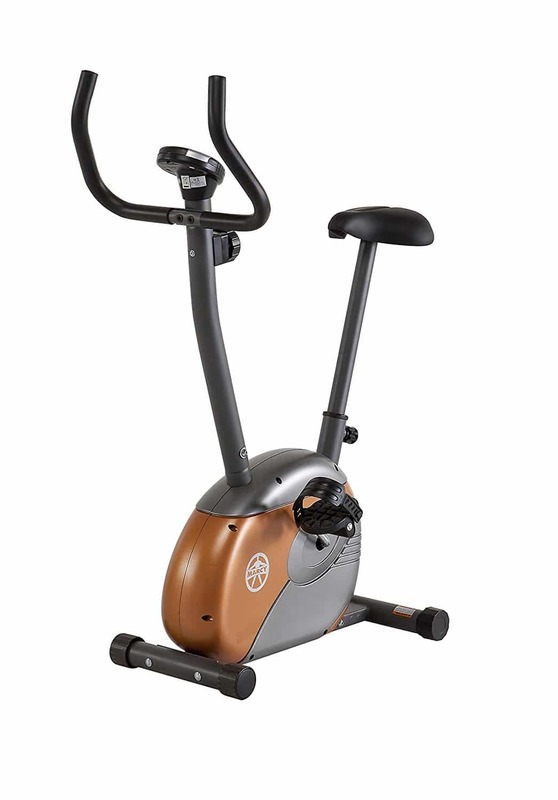 The Nautilus Upright Exercise Bike is a great piece of professional fitness equipment. It’s got a padded adjustable seat, and can support up to 300lbs. You can choose from over 22 programs, 20 levels of resistance, and 2 user profiles, making it very easy to get a varied workout in. The display has 2 LCD windows, which show you up to 13 different details about your workout. It also has a cool feature which lets you export data about your workout to Nautilusconnet.com or myfitnesspal.com, via the USB charging port. The Nautilus has in-console speakers with MP3 input port, and has a 3 speed fan to keep you cool while you workout. It’s a great value for the money and comes with a 10 year warranty on the frame, and 6 month warranty on most other components. Another one of the best upright exercise bikes is this professional grade model by Schwinn. 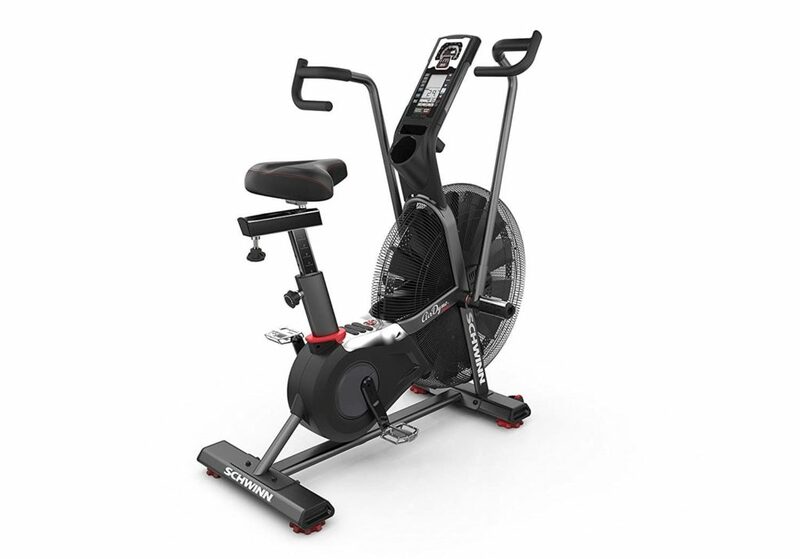 The Schwinn 170 Upright Bike has a thick contoured seat, with 2 types of adjustably to get the perfect fit. It has 25 levels of resistance to give you a variety of intense workout options. You can also choose from over 29 programs, and it has 4 different users settings perfect for a family. The Dual Track two blue back-lit LCD screen System makes it easier to read the programs and goal tracking data, and it has a handy shelf to hold books or electronic devices. 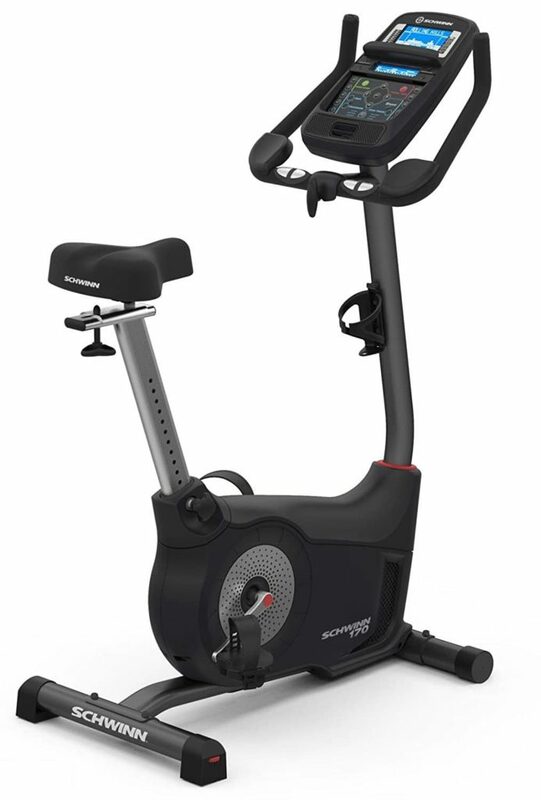 The Schwinn 170 is equipped with Bluetooth connectivity so you can sync your fitness data, as well as a Charging USB port, speakers, and an adjustable three speed fan. It has a ton of nice functions for an indoor bike under $500, and it is backed by a Schwinn warranty. 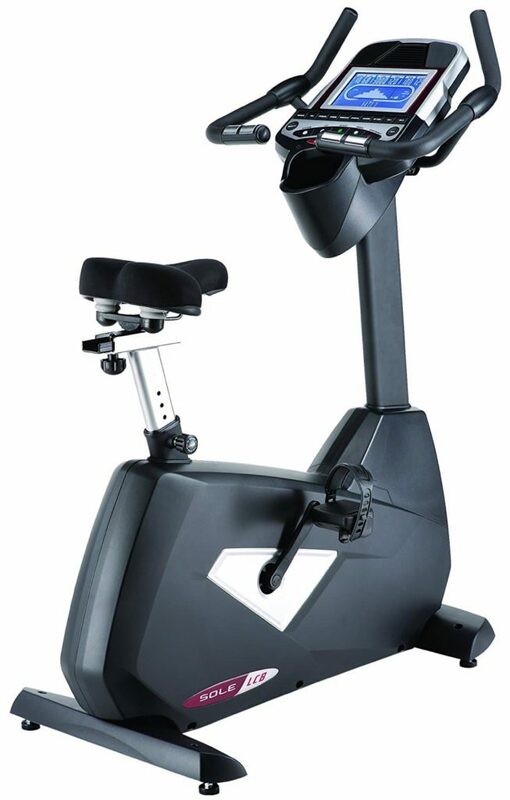 Another great pick for best upright exercise bike is the 7.3AU by AFG. It is a sturdy piece of equipment that is perfect for a home gym, and it has a comfortable adjustable seat. The machine has 20 different resistance settings, and you can choose from over 23 presets for a challenging workout. The LED displays help keep you informed of your progress, heart rate, and calories burned, and you can sync your MP3 player and listen via the built in speakers. This model by AFG is simple yet effective, and even has portability wheels to easily move it out of the way. 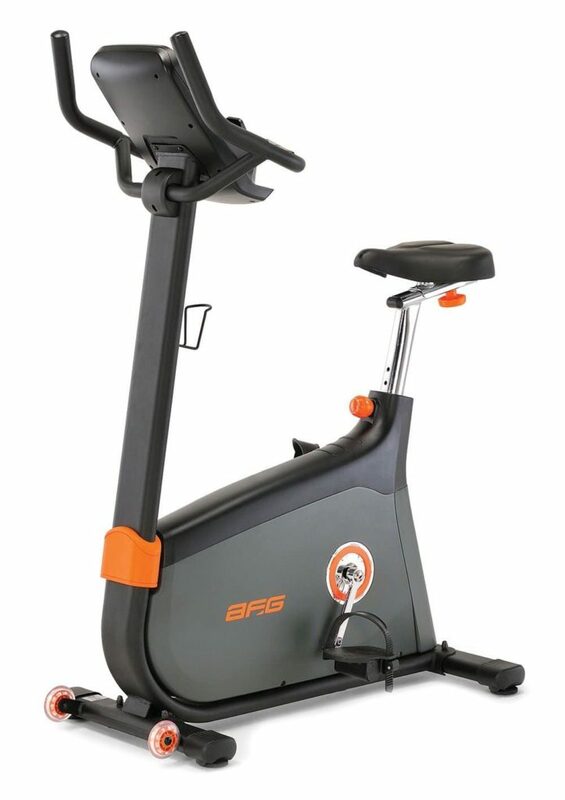 Overall this indoor bike it a high quality choice, and it comes with a manufacturers warranty. This Upright exercise bike by Sole Fitness was designed for professional or home use, and its easy to set up anywhere! It has an adjustable seat with a comfortable gel cushion, and supports a weight of up to 200lbs. It’s got commercial grade LCD panels with a blue blacklight that helps you to see the screen perfectly. 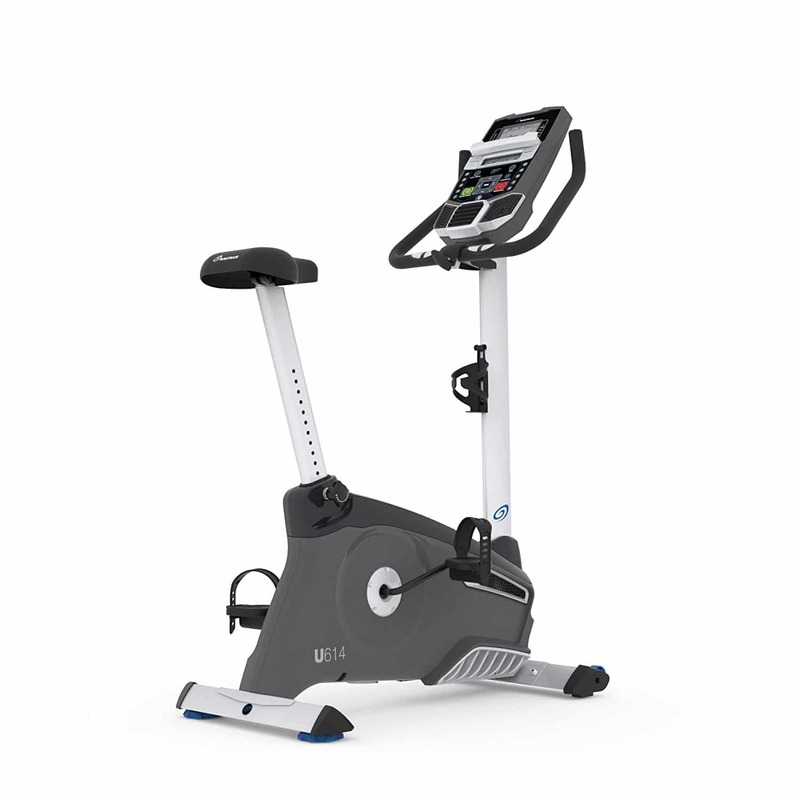 The Sole Fitness upright bike has 10 different programs, up to 40 levels of resistance, and a heart rate monitor. It is not as portable as some of the other models though because it doesn’t have wheels, however it doesn’t take up too much space. It’s got nicer features like a water bottle holder and cooling fans, but no media shelf. This product is built to last, and comes with a comprehensive warranty that covers the frame for life, the parts and electronics for five years of residential use. This professional level upright exercise bike by Schwinn is another stylish choice for cycle lovers. It’s got an oversized, cushioned seat with a features that helps you get biomechanically correct positioning for the perfect knee placement. This Schwinn bike uses progressive wind resistance technology, that gives plenty of options for beginners up to exerciser to elite athletes. This bike also features a Custom 26-blade fan which helps users burn more calories compared to a leading competitor fan bikes at the same RPM. The center console has a handy Tachometer that visually signals your workout, and also keeps you up to date on your heart rate, time, and calories. One of the best features is the hit programs like 20/10 or 30/90 which help you get in a challenging workout. 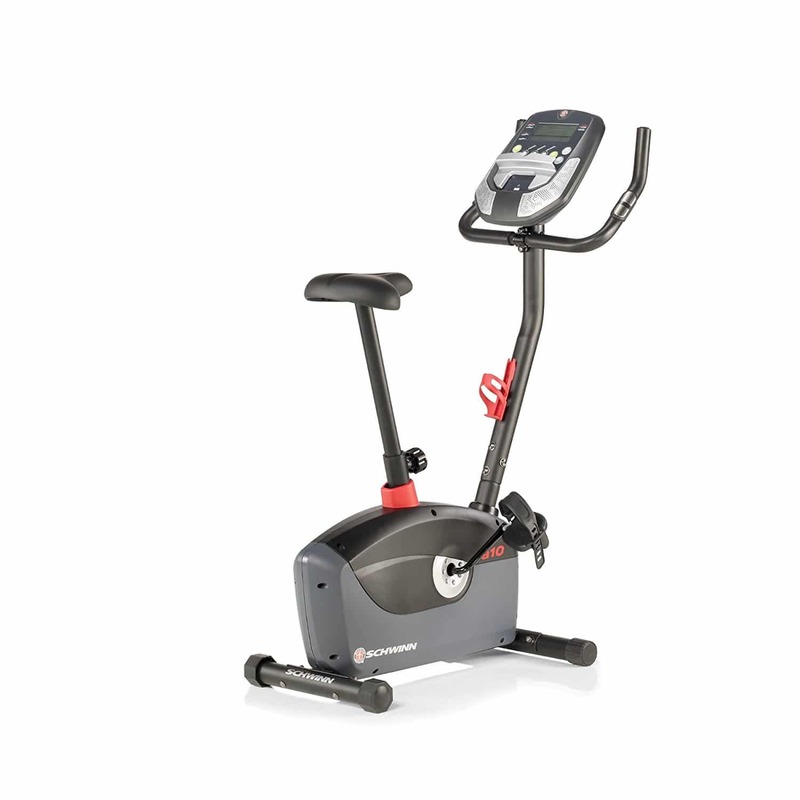 Overall it is another high quality machine from Schwinn, and is backed by a limited warranty. This SportsArt machine is our final pick for best upright exercise bike, because it is a piece of quality and professional level equipment. It has up to 40 levels of electromagnetic resistance, as well as oversized pedals for maximum comfort. The seat has fore-mid-aft seat adjustment, so you can be in the optimal positioning during the ride. 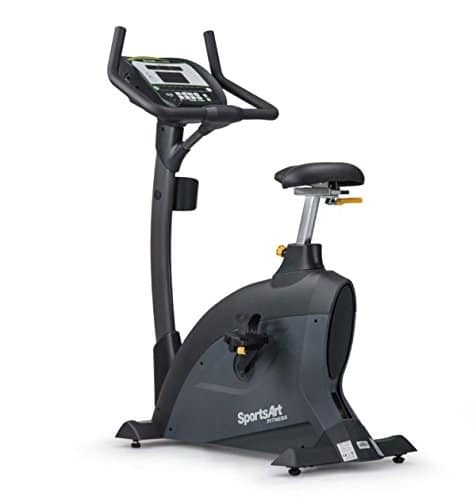 The SportsArt upright exercise bike has a Tri-Color LED display, with ActiveZone and Cardio Advisor setting to improve cardio workout efficiency. It also has other programs like Manual, Random, Interval, Plateau, Fat Burn, YMCA Test, Heart Rate Control to keep you at peak fitness level. This bike isn’t very easy to move around, but it is very sturdy, and comes with a comprehensive warranty package. And there you have it, the best upright exercise bikes in every price range. Remember when choosing a bike to think about how often you will be using it, and where you will be keeping it at home. These factors along with your budget will help you pick an indoor bike that you will love for years to come. We hope you enjoyed this review of the best upright exercise bikes, and happy cycling!